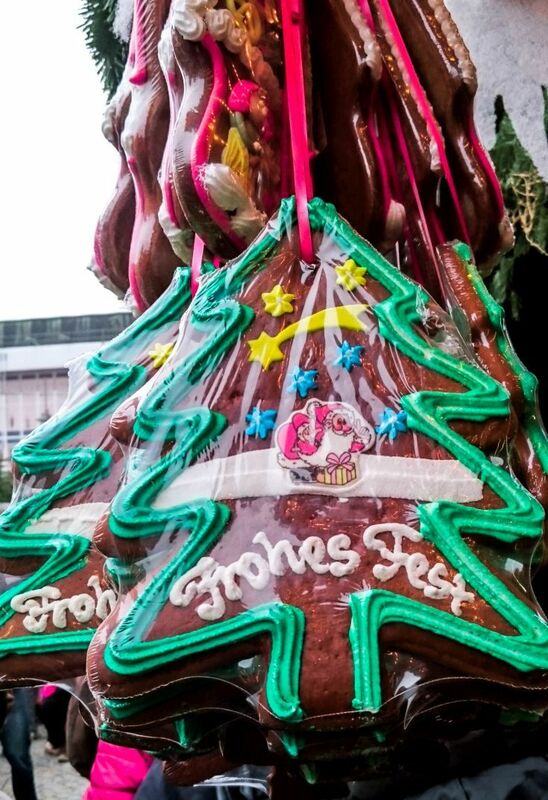 7 Tips for Winning German Christmas Markets with Kids! ‘Tis the Season! Everywhere I look there are signs up for the opening of the Christmas markets all over Germany; I’m so excited! There’s nothing better than grabbing some friends, getting all bundled up, and heading out to the nearest market square to wander among the little brown wooden huts filled with the sights and smells of the holidays. As we know, Christmas is for kids, all kids, yet taking them to a crowded marketplace can be a daunting task. 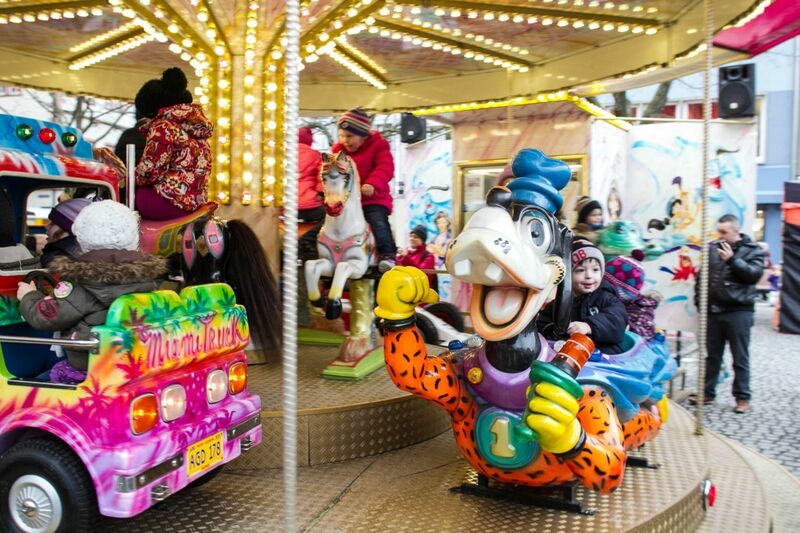 Here are some of our tips for really enjoying a German Christmas Market with kids in tow. Disclaimer: Some of our articles may contain affiliate links; when you click on these links you'll have the option to purchase or register for a service at no extra cost to you, but doing so helps us run this blog. That's awesome! Tip 3 – Baby Carry or Stroller? 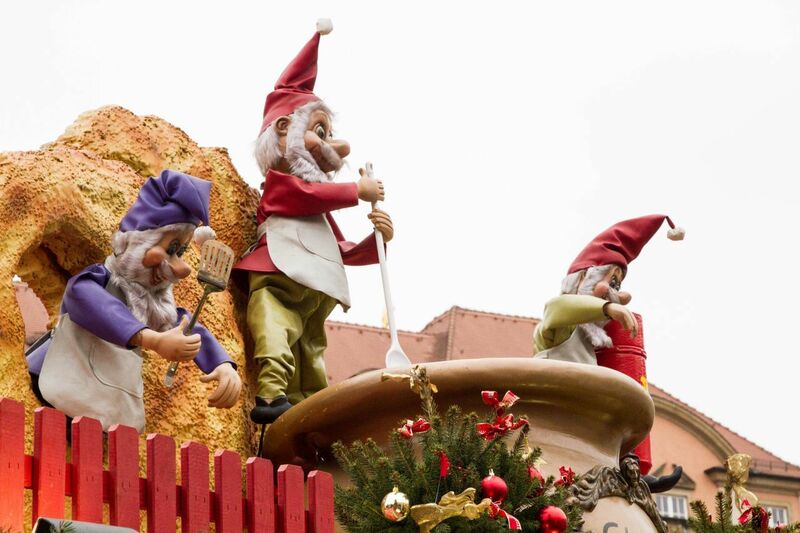 What Christmas market tips do you have? What is your child’s favorite market activity? 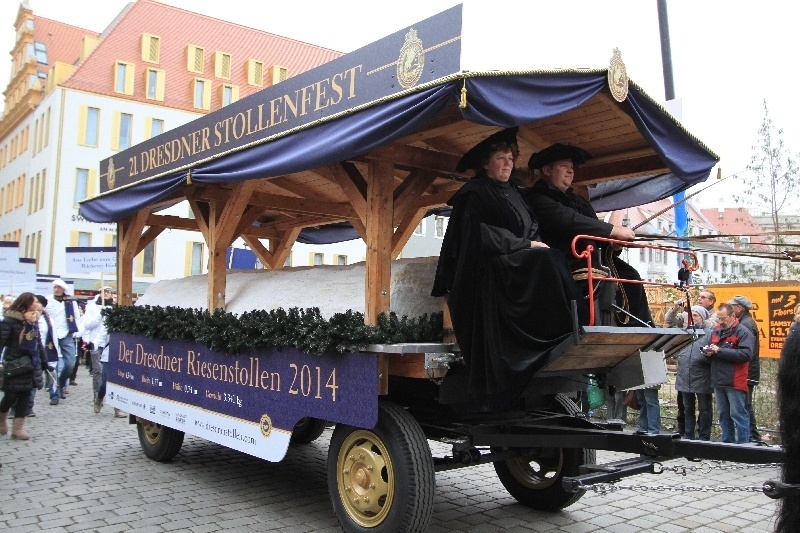 Getting to a Christmas market in Germany is pretty easy. Every large city hosts at least one, and many of the small towns do as well. Taking public transportation from your lodging would be best, because the metro or tram will invariably drop you right in the thick of things, but if you are driving then plan your parking ahead of time. There will be parking along the streets, and it may even be free, but I would highly recommend parking in an underground garage where it’s warm and lit. Plus after walking in the rain, snow, sleet, and cold for a few hours the last thing you are going to want to do is clean off your car. And at some of the larger markets, finding parking might be a challenge; knowing where the parking areas are ahead of time may be crucial. Depending on the size of the Christmas market it never hurts to have a plan. Children of all ages love to have a voice about what they want to do. Have a chat on the way. What does everyone want to eat? What rides are they interested in? Is St. Nick making a showing? What time will he be there? Having a short checklist of what everyone wants to do makes it easier to say to Junior, “Right now we’re getting Daddy a cup of gluhwein, but we’ll head over to the cotton candy next!” No problem. Also while you’re planning, tell the older children how much they have to spend. It’s a great lesson on budgeting your money or not spending it all in one place, and they’ll be much pickier about what they buy, too. Don’t forget the stroller. 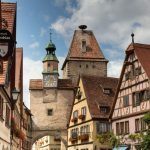 Even though some smaller, quainter Christmas markets will be along narrow winding roads, probably on cobblestones, for the most part a stroller will serve you well. For one thing, you can carry a blanket or umbrella to keep warm, but also it will give you some room when it’s really crowded. Additionally, what a great place to stash all of those new handicrafts or ornaments that you’ve just bought. German weather is notoriously rainy or snowy or, worse, both during Christmas market time. Other times it’s a balmy 14 degrees Celsius or sometimes it’s down around the zero mark. It’s hard to tell just how cold it will feel, and no one likes to get cold toes, fingers, or ears. The first thing you need to do is be careful bundling up. With all the running from one charming booth to another, you could warm up very quickly so the trick is to layer. Wearing a fleece under the jacket will give you and the kids a little flexibility. Warm socks in boots, mitten, and hats are a must. Even if the jacket is off, they will keep those little ones happy and warm. The larger Christmas markets can help you while away the hours, but meantime the kids need a break. Most have a fairground complete with games and rides for children that only cost about one Euro per ride. There are always gluhwein and bratwurst stands nearby, so you can give the children a break to have fun while you’re sipping a hot drink. Notice where the fast food restaurants are as well. You will want a warm place to maybe get a drink and go to the bathroom for a sit down break for the whole family as well. The whole family will enjoy seeing all the uniquely German Christmas decorations, and there are a couple of things you shouldn’t miss. There is usually a very large Advent Calendar with doors that open each day before Christmas to show a traditional seasonal object. Additionally, no Christmas market would be complete without its own giant pyramid. Some are only one level high, but some have two or three levels. 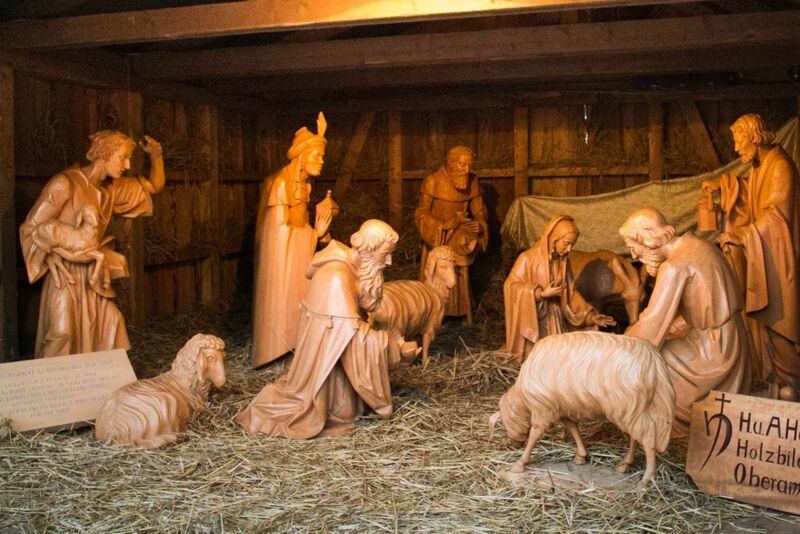 Thirdly, you will be able to find a manger scene. Sometimes there will even be live animals which the kids can pet or even feed. You will certainly want photos of the family gobbling up a huge bratwurst, or talking to St. Nick so make sure your camera battery is fully charged and you have an extra memory card available. Hand the camera to the kids and let them take a few of their own shots or some Mommy and Daddy shots. Also, take advantage of a Ferris wheel and get a few shots looking down on the whole market! Have fun! 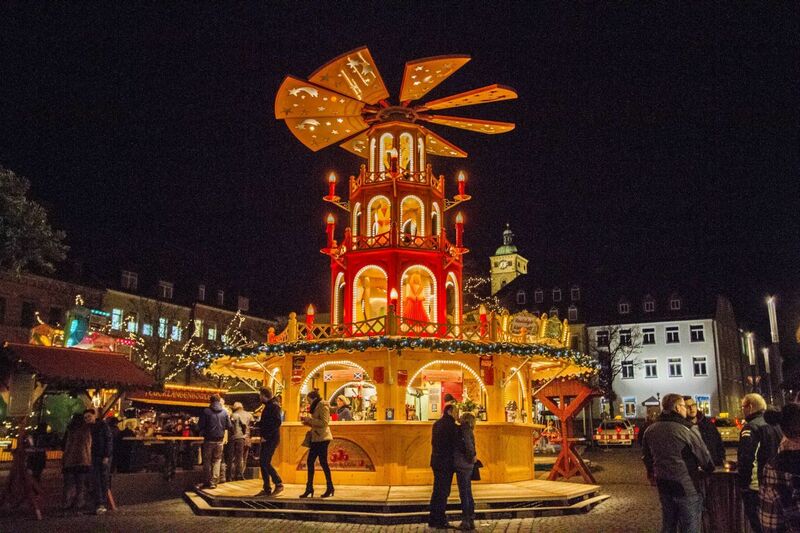 Christmas markets are definitely an activity that fits all ages and budgets and you will love the German festival atmosphere. 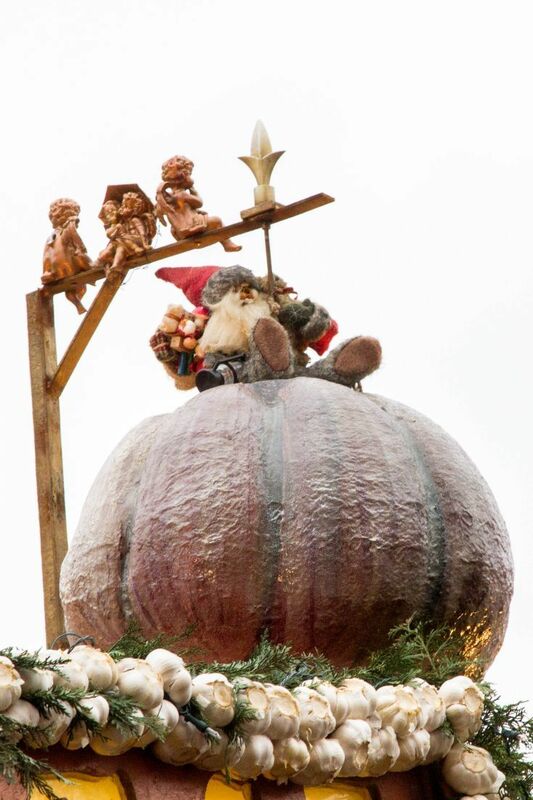 A Fairytale City for All Seasons; Rothenburg Christmas Market and More! Krista, Will you be heading to any Christmas markets this year? Hmmmm. I think I need to run an errand. Yes, that’s it. I need, uh, something from the store. That store that’s right next to the mulled wine…. Kris, You are such a quick learner! we just were in the Xmas Market of Dusseldorf with our just 2 year old son last weekend. He loved it!! He was so sweet that he even got a present from one of the sellers. He only talks words and he kept pointing and saying the name of the wooden animals that were sold in a shop, I was about to buy him one when the seller gave him one, it was one with not so good paint but he really loved it!! As for tips, we prefer to take a baby carrier than the stroller. The markets are so crowded that you cannot really walk comfortably with the stroller. Shere, What a great story! I do agree the markets can get really crowded, and you’re right. In those cases a carrier would be much better. I’ve only ever attended markets with my kids in Australia. My daughter always looked out for art pieces and my son went for adventure games and toys. I’d like to visit a cold weather Christmas market myself in Germany one day. Jan, They are fun! I, of course, really only go for the food. Fest food is always so yummy. I’d add that if you’re going with kids, go earlier rather than later. In the daylight the crowds are somewhat less. You could stay long enough to see the lights on all the stalls as it gets dark, but then leave before people get too drunk and obnoxious on all that gluwein! Rachel, Very good point! Thanks. How to Hanami - Cherry Blossom Viewing in Japan! Japan Travel Blog - Planning a Visit to Japan! Some of our pages and posts have links to products and services we feel are useful for our readers. When you click on these links you will have the option to purchase or register for a service at no extra cost to you, but doing so can help us offset the costs associated with running this blog. Thank you for your support! Amazon Services LLC Associates Program – ReflectionsEnroute is a participant in the Amazon Services LLC Associates Program, an affiliate advertising program designed to provide a means for sites to earn advertising fees by advertising and linking to amazon.com, amazon.co.uk, amazon.ca, amazon.de, amazon.fr, amazon.es, and amazon.it. Amazon and the Amazon logo are trademarks of Amazon.com, Inc. or its affiliates.